The Fresh Store Builder administrator dashboard has the ability to add internal links onto your pages. An internal link is a link on your site that directs to another page within the same site. Links are one of the main ways that Google, and other search engines, learn about how important your content is. Using internal links helps to show Google which of your pages are important, helps Google to find content and helps to describe what that content is about. Internal links can be just as powerful as external links from another website, but are much easier to achieve and often neglected. How do I add internal links to my store? This screen shows all your existing internal links on the right hand side. We are going to create a new internal link, so click Create Internal Links. Firstly, enter the URL of the product that you want to link to (including the http://). In the next box, Keyword, enter the word that you know is contained within one of your other pages (this can be a different product page, a content page, a category page or a manufacturer page). Next we have 4 options as to where we want the link to appear. Select at least one of these, but make sure you have a page of that type that contains the keyword you have specified. The maximum links per page determine how many times the keyword will link back to the page you have specified on one page. Ideally you want this to be quite low or the search engines may think your page is over optimized, so for my example I'm going to keep it as 1. And finally, select the total links to generate. This determines how many different pages will contain the link. I will leave this as 10 however I do not have 10 pages that contain the keyword but this is fine. You can now click Create Internal Links. This will then take you to the next page where you can see the links that have been created. One of the links is on the actual game itself and the other is on the second version of the game. If I had a content page that contained the word Zombicide then this would have also gained an internal link. I now have 2 internal links set up on my site. If i click to view the Zombicide toxic city mall product, I can see on the first line that there is a link to the original Zombicide game (the link being the green text). It is also possible to create internal links manually, or to edit an existing link. To do this, first of all navigate to the product you would like to link tom and copy the URL to your clipboard. For this example, I am going to link the Dominion board game, from the Dominion Seaside board game page (these are 2 separate products). Next, I navigate to the Dominion Seaside product within my dashboard, and edit it. <p>Dominion Seaside is an expansion pack for the award winning deck building game <a href=”[a href="https://tabletopboardgames.co.uk/dominion-board-game/%E2%80%9D>Dominion. The red text above shows my HTLM link. This is made up of 2 parts. After the opening <a, the href=” https://tabletopboardgames.co.uk/dominion-board-game/” is the page we are linking to, and the >Dominion</a> is the text that will be displayed. This is known as the anchor text. Q. How many internal links should I create? A. 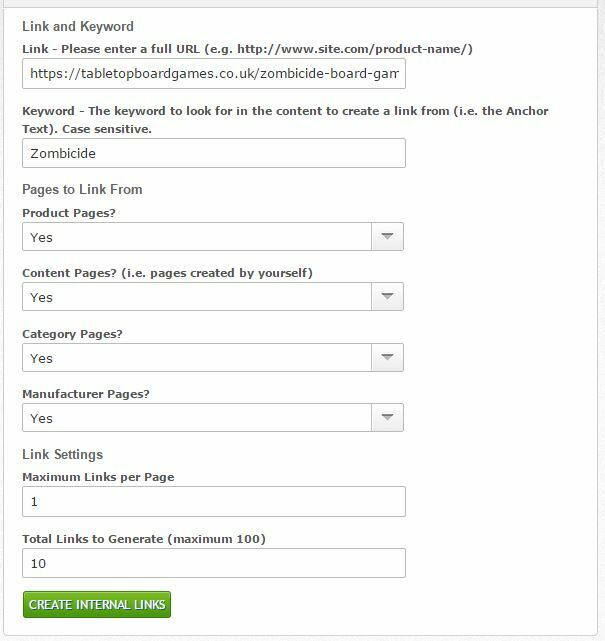 You can create as many internal links as you like, but we would recommend 10 links per keyword and 30 links in total per product/page. Q. Once a link has been created, can it be removed. A. Links can only be removed manually. If you click the Details link on the right hand side (see the above screenshot), next to the ink you would like to edit, this will show you all pages that contain the link. You can then edit each page and remove the link using the HTML editor section of the box. Q. What is Anchor text, and what should it be? A. Anchor text is the text that is displayed when creating a link. For good SEO, anchor text should be relevant to the page you are linking to. So anchor text shouldn't say Click here, it should always be relevant text.